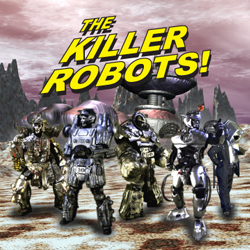 The Killer Robots and the Revenge of the Hot Dog Mafia | The Killer Robots! Check out this acoustic version of Strobo’s song, Revenge of the Hot Dog Mafia. Afterwords, in a short sped-up interview, Strobo explains the meaning of the song and Auto tries to convince him that it’s about a surfing hot dog.